Does being a stay-at-home dad turn you into a woman? As a stay-at-home dad, and as one who is the primary caregiver for a disabled child, I have an interest in this question. So I’m just thinking out loud a bit here. I watched a fascinating Catalyst (ABC TV science) programme early this year which showed clearly that pregnancy sparks significant hormonal changes – no, NOT just in the mother – in the father also! Who would have guessed? These changes, mainly to do with testosterone and oestrogen levels, impact on a father’s body and mind, hopefully enhancing his capacity to be more of a stable, reliable (and overweight) nurturer, and less of a warrior/explorer/conqueror, dickhead, etc. Then today, I read that a study published in the National Academy of Sciences journal has proven that testosterone drops sharply in men who become fathers and, get this, continues to drop if they spend significant amounts of time around their children. Am I now more of a ‘woman’ and my wife, who is vigorously pursuing a professional career, more of a ‘man’? No, I’m not saying that a woman’s place is in the home and a real man is the breadwinner. I’m saying that it has now been demonstrated that our bodies and minds adapt and change somewhat to suit the circumstances in which we find ourselves. What is my body up to? How does it affect a person when nature works against nurture? Who am I now and who do I want to be? Sorry if these questions offend anyone (get over it), they are important to me. ~ by Garry on September 15, 2011. I am not for one moment suggesting that you are a bird brain, in fact far from it, but don’t forget that in the bird world and, also in much of the animal kingdom too, if the facts be known, both parents, male and female become involved in the raising of the family. You are doing alright boyo! Don’t let what some of the scientific world comes out with, get at you, because in most cases they have not, nor will ever have the the opportunity you have to nurture such a wonderful son as yours. There have been huge changes from our generation to yours in sharing the care. I admire you and Brad for your loving care and attention to domestic duties, particularly with the children. In most cases in our generation, the father WAS the breadwinner and the mother the STAY-AT-HOME. The latter was not always a matter of choice as women on the whole had to leave their employment once married (as was my experience.) Where did this theory leave our men in those days in respect to the hormonal changes (or did they not happen then.) Did the program suggest what hormonal changes occur in women who are now taking on chosen vocations which were once strictly for men. Thanks CC, and yes there is no doubt that we humans are far better able to thrive when both parents are involved in the nurturing of offspring, as long as someone is putting the bread on the table. I guess my reflections on the topic are coming from deep within somewhere and I actually find the science helpful – it is explaining some things to me that I struggle with. Mum, I am not aware of any studies, but I would not be at all surprised if it was found that a woman’s hormonal balance is also altered by entering fully into a competitive workplace, surrounded by grown-ups, instead of concentrating primarily on the chillun. 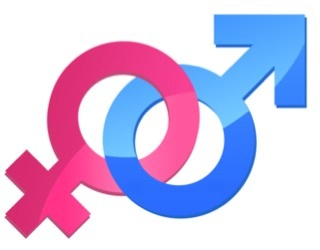 There is a little bit of male in every female and a little bit of female in every male. It seems that ‘the little bit’ can change with different circumstances.